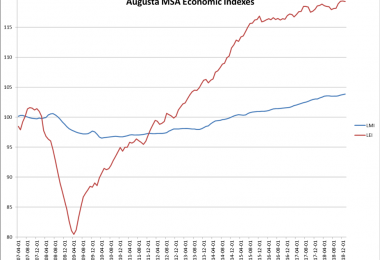 The economic data is in for the first six months of the year so how has Augusta fared? How does this performance compare to other Metropolitan Statistical Areas (MSAs) of the state and the country as a whole? Just like my relay team in the Ironman 70.3 Triathlon – middle of the pack! “I’ve created over a million jobs since I’m president,” claimed President Trump, unfortunately (even if you believe he personally created jobs) none of them were in Augusta! Employment remained flat – 237,600 people employed in December 2016 and 237,500 employed in June 2017. However, there was an increase of 2,600 in July and preliminary estimates from the Bureau of Labor Statistics add another 1,000 in August. The Augusta unemployment rate declined from 5.3% in December 2017 to 4.6% in July. Average weekly earnings have increased about $20 and the labor force (those employed and unemployed) increased by 3,000 people. Weekly hours worked remained flat. 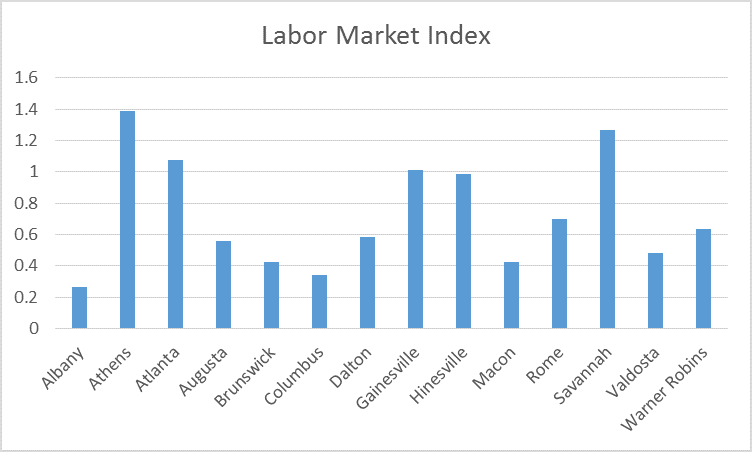 I combine this economic data into a Labor Market Index which measures the state of the labor market. Overall, this index increased 0.6% from December 2016 through July 2017. This places Augusta just below the average growth rate for Georgia MSAs (see chart). 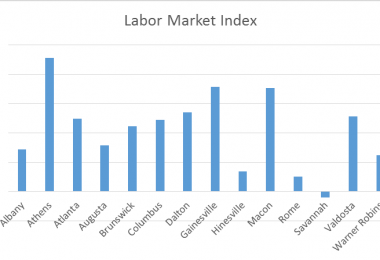 The fastest growing metro areas saw employment growth of 4,800 in Athens and 3,800 in Savannah. Gainesville has the lowest unemployment rate of 3.8% in July 2017. Albany and Columbus have unemployment rates of 5.5%. 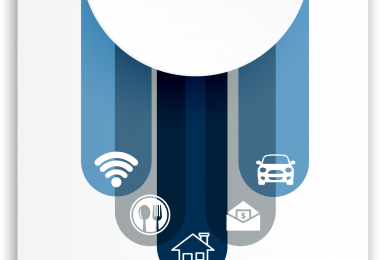 Sectors of the economy in Augusta that saw jobs growth in the first six months of the year were government, leisure and hospitality, and education and health services. Construction only added 200 jobs in 2017. This may seem strange given all the construction occurring locally. But a quick inspections of building sites suggests that many of these projects are being built by out of town firms. For example, the general contractor at Riverside Village at Hammonds ferry is Brasfield and Gorrie, New South Construction is helping to build the new Georgia Cyber Innovation and Training center, and the new Sprouts grocery store is being built by Benning Construction. All these firms are from out of town, though they may employ local workers and contractors. 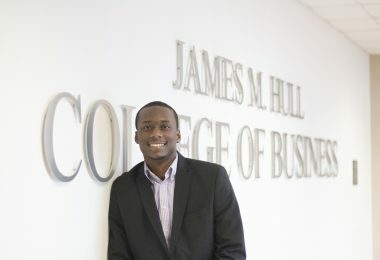 Looking forward to the second six months of the year and the economic outlook is brighter. The Augusta Leading Economic Index also increase by 1.5% on an annual basis, the highest single month increase in a year. In July the increase was driven by a whopping 530 new housing units authorized by building permits. There is a lot of talk about the exciting economic future for Augusta in the local community and some of that may just now be visible in the economic data.